Question – What are Vacuum Bellows & Hoses? 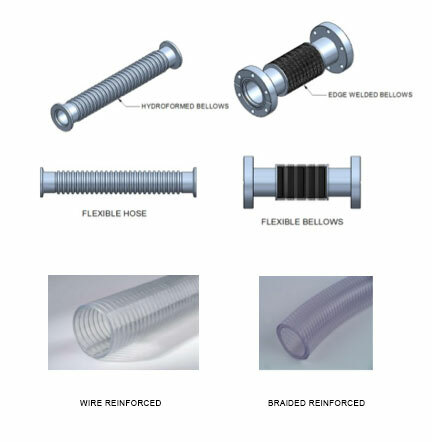 Answer – Vacuum Bellows & Hoses come in different styles, Hydroformed and Edge Welded (see images below) Vacuum Bellows are available in a number of different configurations. Question – What are Vacuum Bellows used for? Answer – Hydroformed Vacuum Bellows are thin walled flexible bellows that are mechanically formed by a Hydraulic forming process that shapes the bellows into the desired size and shape. The smaller size types are very flexible and are commonly used to connect from a Vacuum Pump and a Vacuum Manifold that may be far apart or to reduce the vibration transmission. Edge Welded Vacuum Bellows are manufactured by stamp pressing thin round discs into diaphragms and welding a selected quantity together to form a ‘concertina’ type assembly. The finished welded assembly has a short compressed length and gives a linear stroke that is dependent on the dimensions of the diaphragms and the number of diaphragms in the assembly. They are used on components that give linear motion when it is required to manipulate a substrate or other equipment inside of a Vacuum Vessel. Question – What are the standard sizes for Vacuum Bellows? Answer – Hydroformed Vacuum Bellows can be supplied in different standard sizes as listed in the Vacuum Services Ltd. Components Catalogue and are available with KF (Klein) Vacuum Flanges or ISO Vacuum Flanges. The selected size and Vacuum Flange type is decided by the size of the mating Vacuum Flange on the Vacuum Pump or Vacuum Manifold. Edge Welded Vacuum Bellows are manufactured to order and are available with Vacuum CF (Conflat) Flanges or ISO Vacuum Flanges. The selected size and Vacuum Flange type is decided by the motion distance required, bore size and size of the mating Vacuum flange on the Vacuum Vessel or mating Vacuum Flange on the manifold. Question – What are PVC Hoses used for? Answer – PVC Hoses can be used for low vacuum or water applications. Question – How is the connection made when using PVC Hose? Jubilee Clip to seal the connection. 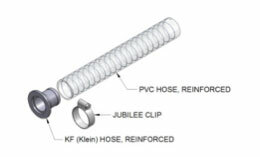 (see image) When the PVC Tube is being used on water lines the connection is made by pushing the suitable sized PVC Tube onto the water line Hose Adaptor and using a suitable sized Jubilee Clip to seal the connection. Question – What are the standard sizes for PVC Hose. Answer – PVC Hose can be supplied in either metric or Imperial sizes. Contact Vacuum Services Ltd. to discuss your requirements, pricing and delivery. Please Note: Vacuum Services Ltd do not have a minimum order quantity, if your needs are for a 1 off flange, centering, gasket or clamp and we receive an order before 2,30pm we will ship to you the same day.